Welcome back dad! 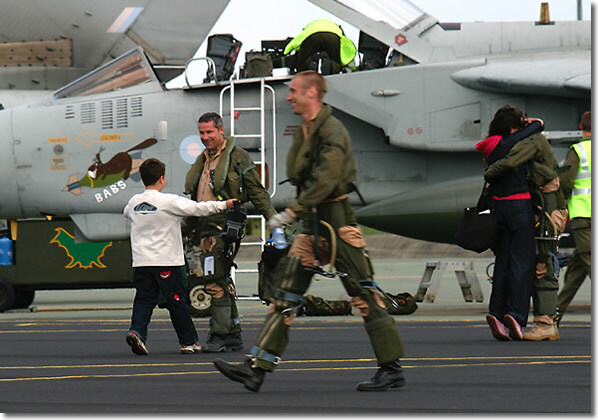 After twelve weeks away, IX(B) and XIII Squadron aircrew are greeted by friends and family on May 6th. ZD850/AJT wearing the 'Gulf' grey scheme adopted for Op. Telic. Reflecting the medium to high altitude PGM missions now flown it was felt a light grey was more appropriate than the desert pink used in 1991. ZA542/DM taxi's onto Marham's ASP following the four hour flight from Akrotiri, Cyprus. 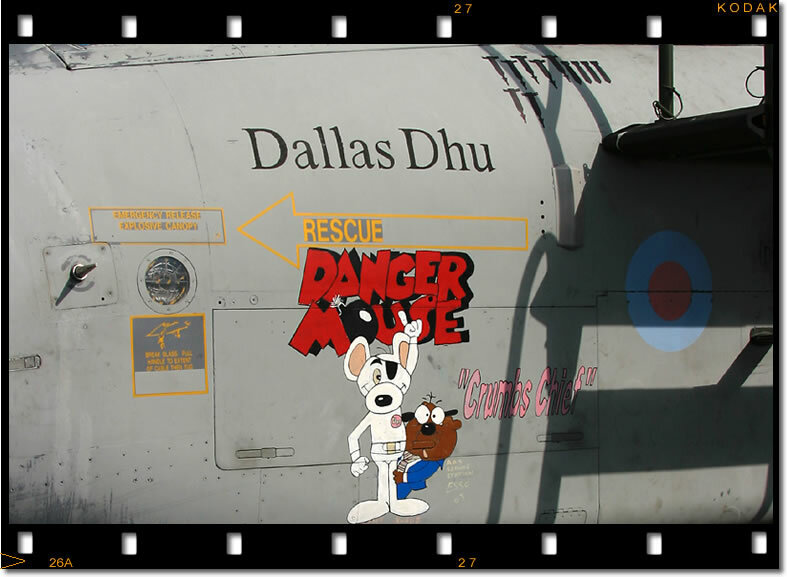 'Danger Mouse' cartoon nose art on ZA542. The theme of the artwork would reflect the aircrafts tail code, in this case 'DM'. ZG707/B named B.A.B.S. arrives back home May 6th. Artwork on ZG707/B depicting a Beaver riding a LGB, holding a wrench. ZG726/K "Kylie". Artwork depicting women was frowned upon officially in case an aircraft had to divert to Saudi Arabia, with its religious sensibilities. This one slipped past the censor though! ZD714/AJW. 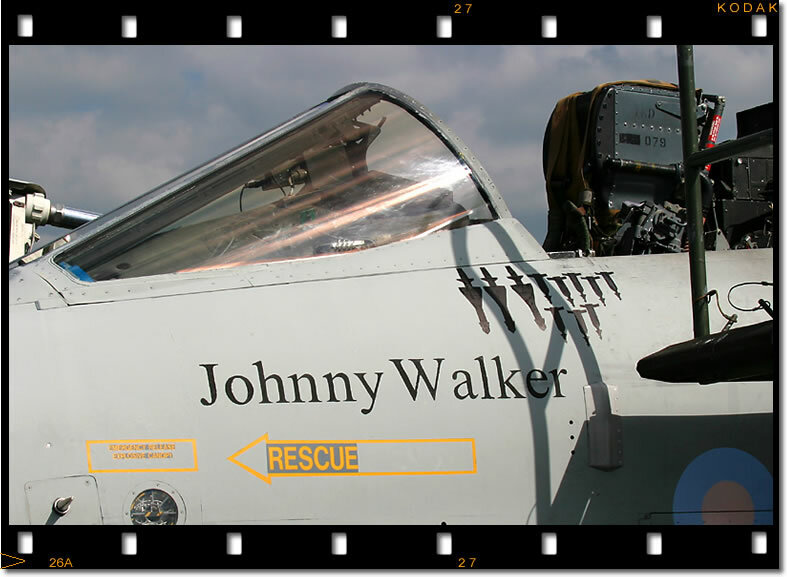 "Johnny Walker" of 617 Squadron. Their aircraft sported the names of Scottish whiskies. 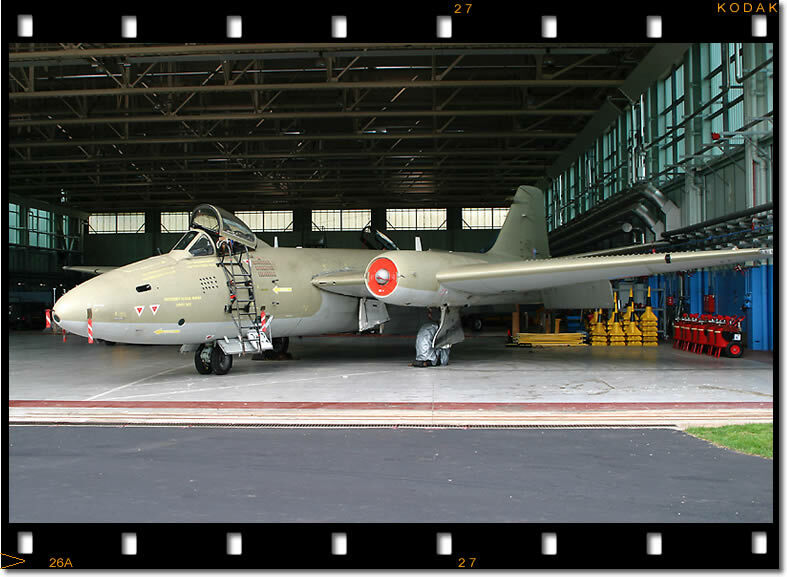 XH135, one of two Canberra PR9s of 39(1PRU) Squadron to fly Scud hunting missions in support of Operation Iraqi Freedom. 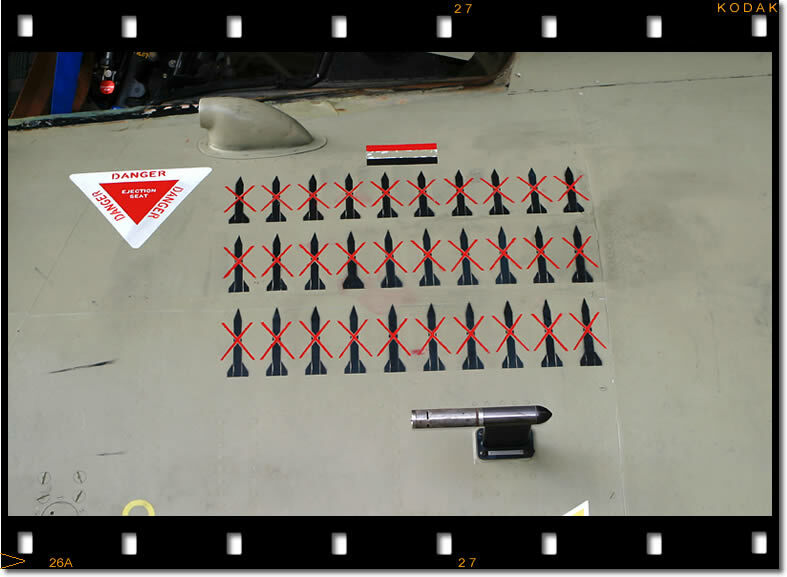 EOS-10D 28-105mm Scud missiles crossed off below an Iraqi flag depicting the number of missions XH135 flew during the conflict. 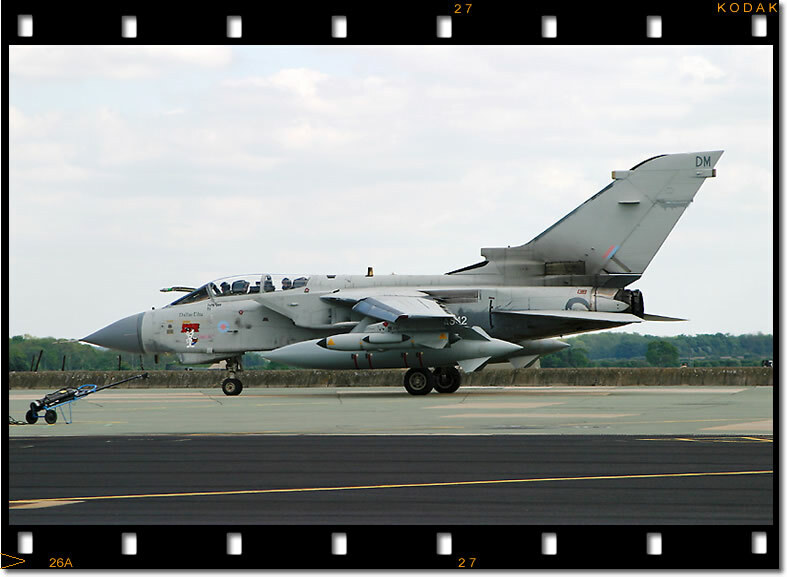 Four Tornado GR4s return home to RAF Marham from the Gulf (via Cyprus) on Tuesday May 6th. Waiting to welcome them home were family, friends and the media. 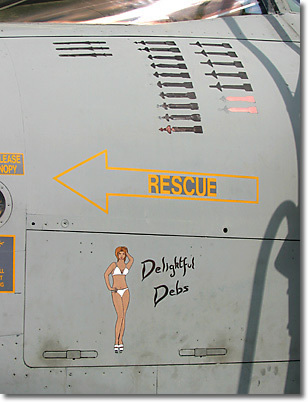 "Delightful Debs", Tornado GR4 ZA607/AB also marked up with ALARM and LGB mission tallies. 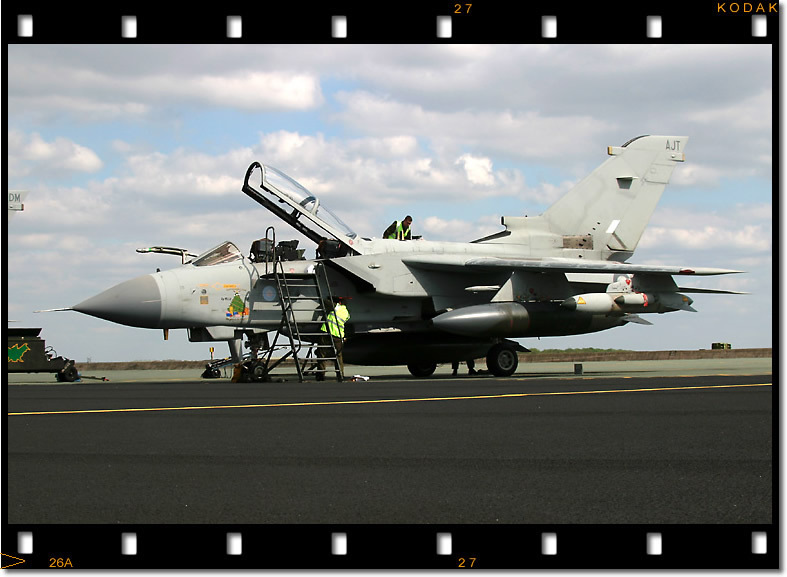 It was the mission that every Tornado crew had looked forward to most, the final leg of the journey home to RAF Marham and their conclusion to Operation TELIC (derived from the Greek meaning 'purposeful'). The plan was that eleven Tornado GR4s would make the journey, one broke before leaving their deployed location in Kuwait and another two were unable to depart Cyprus on the final leg. 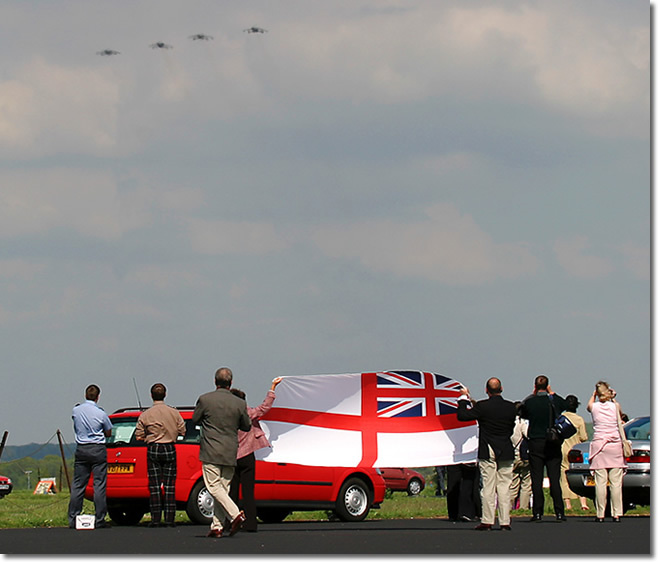 So it was on a warm spring afternoon on May 6th that the surviving eight Tornado GR4s screamed over the waiting family and friends gathered with flags and cameras to welcome their fathers, husbands and son's back home. Although personnel from II(AC) and 31 Squadrons had returned the previous week on a transport aircraft, the IX(B) and XIII crews returning today would signify the largest single return by the Marham Tornado fleet and would symbolize the return of the majority of Marham's squadrons. 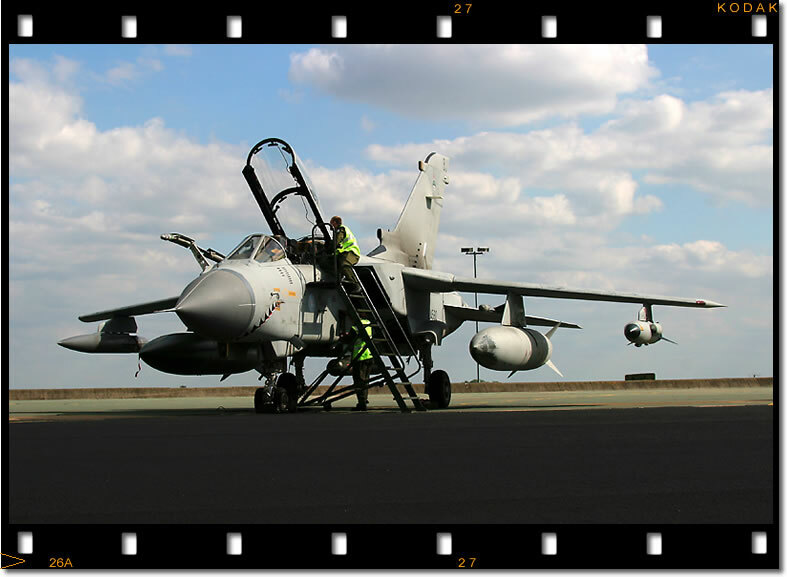 Although the majority of RAF assets in the Gulf have now returned a number of Tornado's will remain in-theatre to support coalition ground troops inside Iraq for the foreseeable future. The Defence Secretary, Geoff Hoon, announced operation TELIC back on February 6th. It would comprise of 100 aircraft and 7000 support personnel. The Marham element was to provide and support offensive air power as an Expeditionary Air Wing (EAW) comprising of 18 Tornado aircraft and the pooled assets of four Marham squadrons, II(AC), IX(B), XIII and 31 (who were already deployed to Kuwait for Operation Resinate, the patrolling of Southern Iraq's no-fly zone) The 'Air Combat Wing' would also consist of 12 Tornado GR4s of 617 Squadron from RAF Lossiemouth. 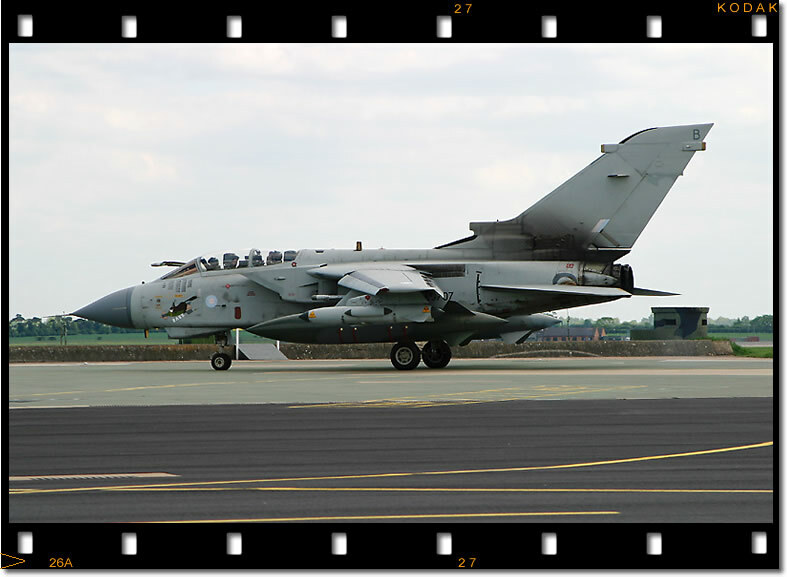 Marham's Tornado GR4/4As began departing for the Gulf region on 10th February. The RAF component flew ten percent of the overall sortie rate for Operation Iraqi Freedom, averaging between 120 and 140 missions per day at the height of the war. The returning crews were met by Air Chief Marshal Sir Peter Squire, Chief of the Air Staff, who said: "It is a happy day for the Station that the crews are returning, but tinged with a degree of sadness at the loss of two colleagues in the early stages of the campaign." An errant Patriot missile killed Flight Lieutenants Kevin Main and Dave Williams, a pilot and navigator from IX(B) Squadron as they returned from a combat mission on March 23rd. The Commanding Officer RAF Marham, Group Captain Bob McAlpine is one of the dwindling number of pilots still around who can draw on experience from the 1991 Gulf war. His insight and knowledge would no doubt have helped him to explain to the current aircrew and support personnel what they would be likely to experience as they prepared to deploy. He did not put any real meaning to the name of the operation, 'TELIC', it was just another computer-generated name. Until, as he explained to the gathered press on May 6th: "One of my Airmen pointed out to me, 'Ey-up Sir, course I know what it bloody well means, Tell Everyone Leave Is Cancelled'." The Fat Ladies Not Singing Yet! Another Marham squadron that quietly deployed to the Middle East was 39(1PRU) with their Canberra PR9s. Although the two Canberra's that deployed are 44 years old this year the squadron was tasked with the important Anti-TBM reconnaissance role - Scud hunting. Wing Commander Ken Smith, OC 39(1PRU) Squadron explained that despite their age, the aircraft are still performing magnificently: "It is a mature aircraft, but also an extremely capable aircraft but it does take a lot of work for the engineers to keep it serviceable. In the hot, dry weather we got about 95 percent serviceability which is really good for an aircraft of that age." Also notable is the experience of the squadron's aircrew, with both a pilot and navigator flying recent combat missions at the age of 57. 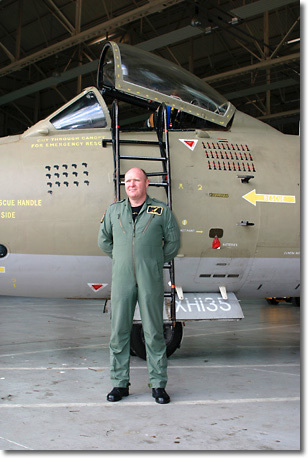 New aircrews are still converting to the Canberra, with two ex-VC-10 pilots recently becoming mission ready. The Canberra PR9s have about three more years of useful airframe life left. Unfortunately when they are finally retired there will be nothing to replace them in their role of high altitude reconnaissance. They will be sorely missed. With thanks to the RAF Marham CRO and staff for their assistance in the preparation of this article. 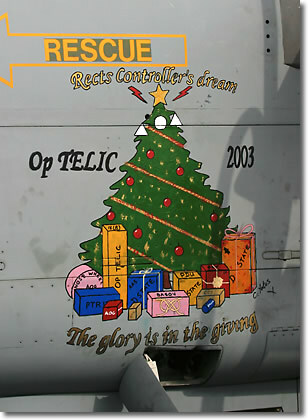 ZD850/AJT - Christmas tree with spare part gifts, inscribed 'Rects Controllers Dream' and 'The glory is in the giving' Also a small round bomb with a face with 'Boing' written next to it. ZG707/B - A beaver riding a LGB with a wrench in its hand (paw?) with the initials B.A.B.S. ZG726/K - Painting of 'Kylie' on the starboard side. Has a 'Combat Air Wing' badge on tail. Wing Commander Ken Smith, OC 39(1PRU) Squadron. 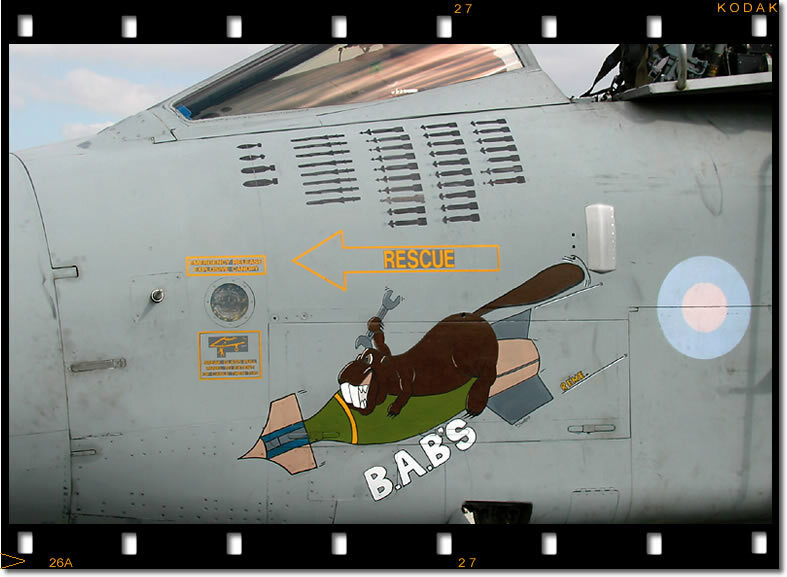 The artwork applied by the squadron groundcrew on ZD850/AJT is believed to have originated due to this aircraft becoming unserviceable and donating various parts to the rest of the fleet in Kuwait.